Worldwide icon-chevron-right Europe icon-chevron-right United Kingdom icon-chevron-right England icon-chevron-right London icon-chevron-right Salut! 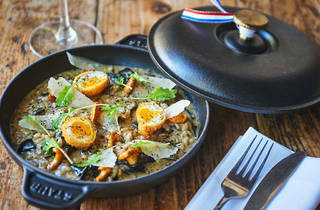 Modern European serving fancy plates at prices as friendly as its name. 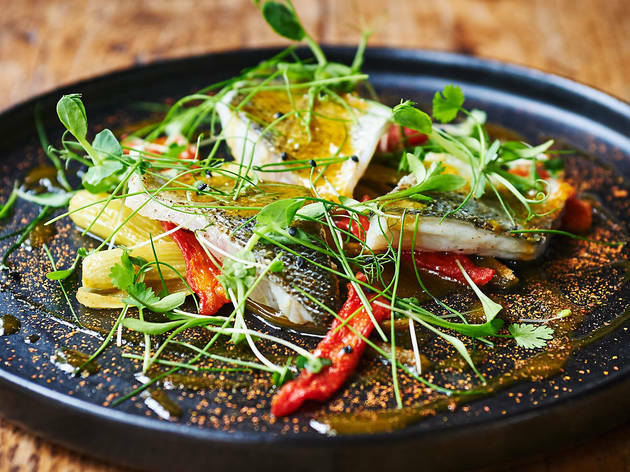 Opening a new Modern European restaurant in N1 takes guts; it must be the only London postcode where it’s easier to get a side of samphire than a bucket of fried chicken. But within weeks of opening, Salut! 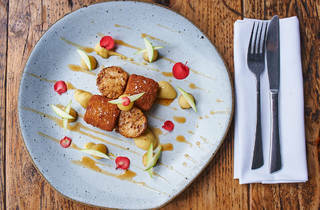 is already booked up at weekends: Islington already loves it as much as we do. Brothers Martin and Christoph Lange grew up in Germany, both attending catering college aged 16. 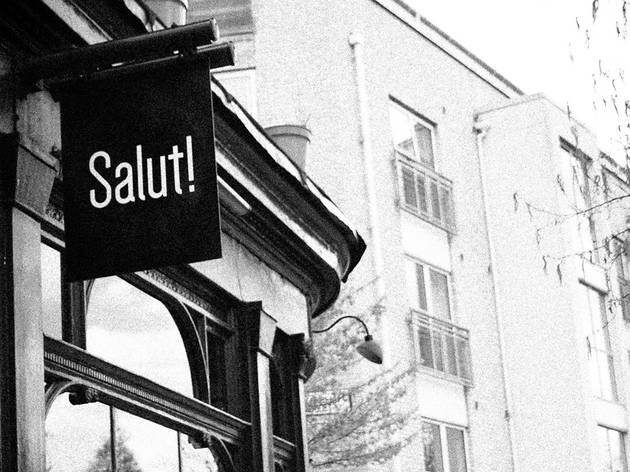 After Christoph went on to work at highly regarded kitchens all over Europe (including Norway’s Maaemo and Denmark’s Noma), they’ve now opened Salut! with Martin’s girlfriend. A thoroughly modern family business. Every last detail at Salut! gets the Langes’ personal attention – answering the phones, wiping plate edges, checking you enjoyed your meal. The latter must be their favourite bit, because I really, really enjoyed the meal. Never have I known a menu to undersell its dishes with such modesty. 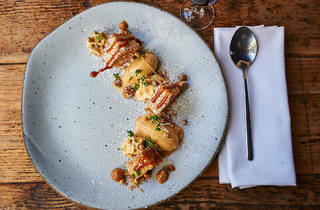 King crab and watercress came with unexpected crab roe foam and micro herb pesto; the ‘selection of onions’ with a juicy pork belly was actually three colourful piles of alliums that were in turn pickled, caramelised and charred to perfection. Anywhere else, I’d frown on such haute cuisine-y touches, but here every last blob and flourish is an improvement on what you ordered. And, thanks to the open kitchen, you can watch Christoph studiously work his magic. The attention to detail does slow things down rather – with only the brothers on duty, we waited a stomach-rumblingly long time to order. I hear they’ve now got weekend help though (and, let’s face it, it’s worth a wait if the end goal is better dinner). 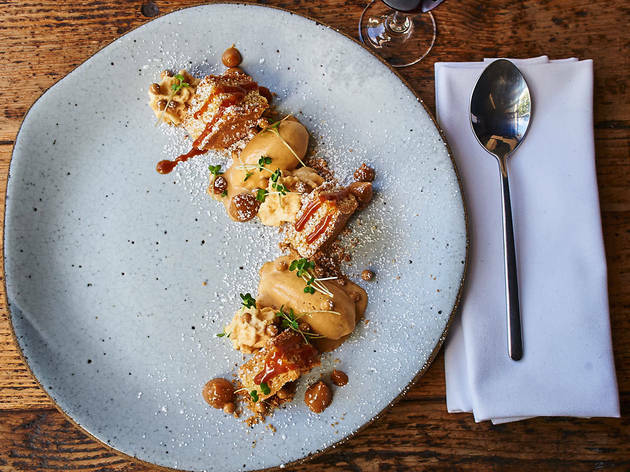 Dessert’s certainly worth making time for – from now on, poached pear will never be right without fermented berries, rich fruit jelly, hazelnut crumble and white chocolate foam. You’d think all that fancy would come at a price, but the crab was a bargain at £5.90, the generous main course a reasonable £16.20. Crusty bread and a few other surprise treats were on the house and we were recommended excellent wine at £25 a bottle. ‘Salut’ is the French way of saying ‘hi’, and means ‘cheers!’ in other parts of Europe. 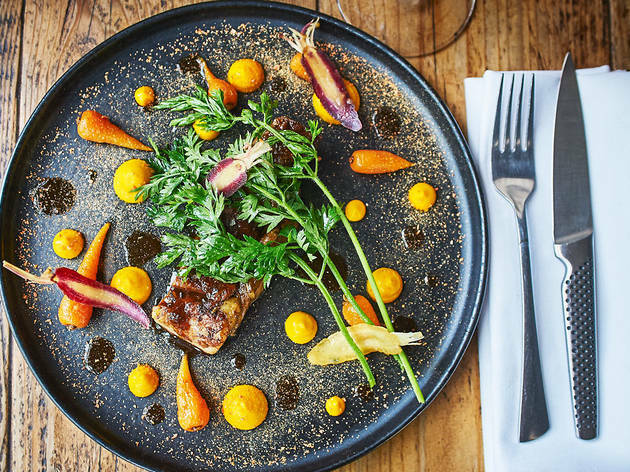 The positive name fits this special little restaurant; we raise our glasses to the Langes for proving that everything tastes better when you care. For the food and wine lovers, Salut! is an invitation to an European journey. 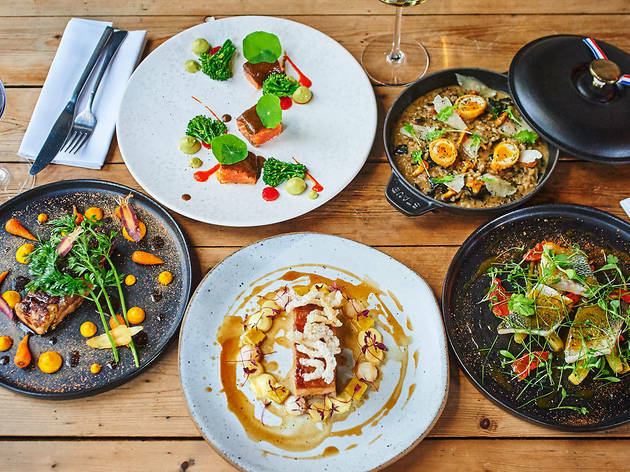 This is a modern independent restaurant offering a relaxed and intimate atmosphere where you can watch your dishes been prepared from the open kitchen. 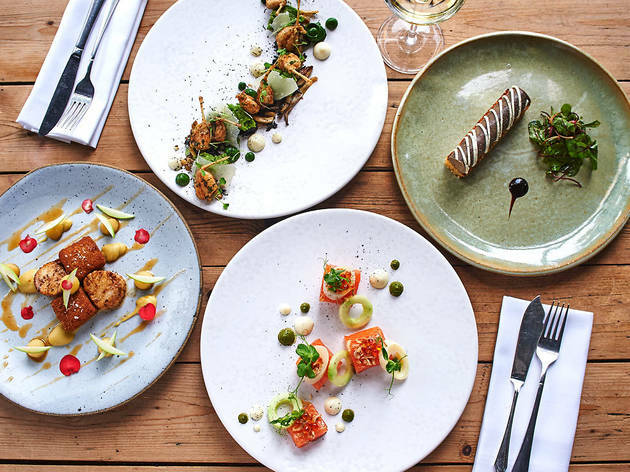 We use the very best ingredients we can find and have selected a special wine list from small producers including organic and biodynamics. 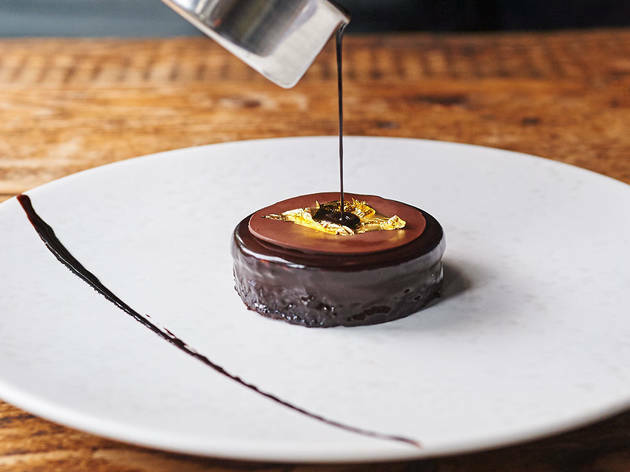 Everything you expect of a neighbourhood restaurant with a refined approach. Find Salut! on Essex Road, a short walk from Dalston Junction, Canonbury and Essex Road rail stations. Salut is a cosy restaurant with a local feel to it, quiet when we arrived at 6:30 but quickly filling up as 7pm rolled around. 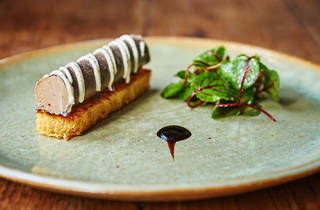 It was my favourite kind of food - beautifully presented but full of flavour in every bite. I started with mackerel then had duck for main and made my dinner companion share the chocolate dessert (I can never refuse dessert). 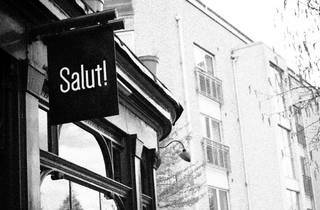 What stood out at Salut was the impeccable service, perhaps because it was such a compact venue. The staff were so attentive without being overbearing and gave us time to peruse the menu (more than once). Ended up staying for 3 hours! Thoroughly enjoyable meal experience. Came here to celebrate my sister's birthday recently. It's certainly a special occasion restaurant as the prices are very high - probably a little too high in my opinion. The restaurant has a lovely cosy feel to it, and the fact that you can see the chef cooking adds to the charm. Food was nice but nothing groundbreaking. We had chicken liver parfait, frogs legs, and scallops to start - all good, the parfait was probably the standout. For main course we had risotto, deer, and sirloin - again, all tasty, but nothing outstanding. The poached pear for dessert was delicious; the ginger bread was disappointing. Service also left a bit to be desired - we had to look around to get the waitress's attention on a few occasions, and she cleared plates before my boyfriend had finished eating, which I thought was the #1 rule in a good restaurant! Anyway, it was still a nice meal but for the price I probably wouldn't return. I went to Salut! with a friend a couple of months ago and will definitely be going back very soon. 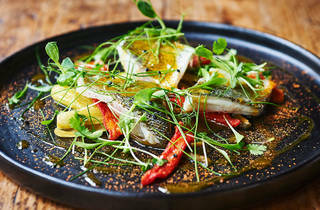 The Nordic influences are evident all over the menu but are combined with French flavours on most plates. We really loved the food, which was really tasty and well presented on each and every plate. I will never get tired of watching my dinner being prepared in an open kitchen, which is what happens at Salut! The interiors are also very Scandinavian, keeping colours and decorations to a minimum and focusing on cozy details like large windows, copper ceiling lamps, wooden tables and candles instead. Even the bathrooms are full of candles and nicely designed , which I always think is a plus for a restaurant. Both my friend and I are Scandinavian and had been hearing a lot about Salut! 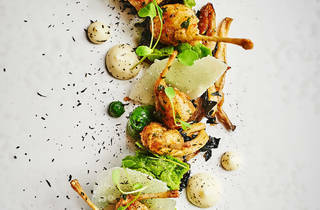 and how it's a great example of New Nordic cuisine. Naturally we went there with high expectations but the food didn't let us down one bit! We started with some bread and truffle butter, which was an excellent start to our dinner. We could literally spend the whole evening eating just that as Salut! 's bread was a tasty, moist, wholemeal sourdough. The butter was also delicious and appropriately salted. We shared two starters; the Sweet Pea Veloute, Spring Onion, Rosemary Cream and the Ox Cheek, Roscoff Onion, Nasturtium, Enoki Mushrooms. We loved them both and even though the portions look small at first sight there is definitely enough for two people sharing. The ox cheek melts in your mouth, it was so delicious! For our mains, my friend had the Suffolk Lamb Loin, Sweetbreads & Neck, Radish, Kale & Wild Garlic while I had the Rainbow Trout, Celeriac, Fennel, Tomato, Loveage Foam, Keta. No disappointment here either! As with the starters, the portion of the main dishes also looked small at first but we were so full after and would not have been able to eat anymore, even if it was there. That did not keep us from ordering dessert though, as we wanted to try everything. We shared one dessert, the Poached Rhubarb, Vanilla Crème Patissier, Crème Fraiche Sorbet & Rhubarb Jelly and boy was it good! 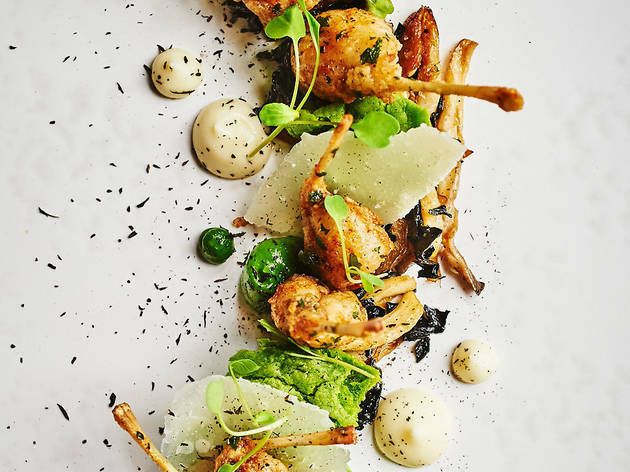 Throughout the whole menu, there is so much flavour coming out of every element of every dish. I have always been skeptical when it comes to foams for example, but the foams I had at Salut! were simply delicious! Overall, the presentations were spotless, the prices reasonable for the quality you get and the flavours amazing. The service was good, the staff friendly and the surroundings cozy. I can't award Salut! anything less than five stars! Small, cosy and off the beaten track this place makes you feel like you've made an amazing discovery.The complexity and skill of the cooking is outstanding for the price so definitely one to check out. Upper Street has been nicknamed Supper Street for its abundance of restaurants. But it's sometimes good to take a step aside. 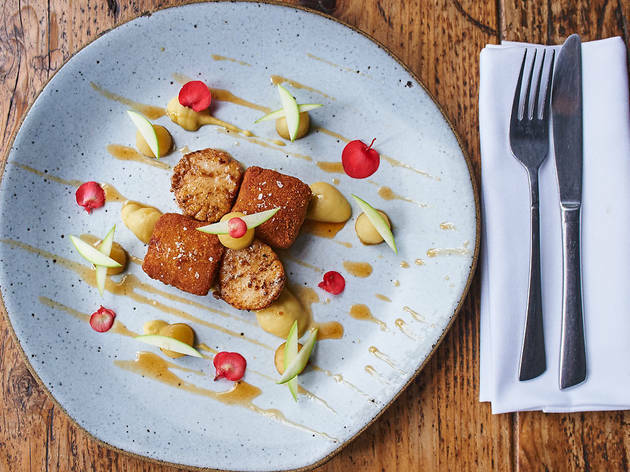 Nestled on a corner of Essex Road, the restaurant Salut! is worth the visit. The founders are two brothers, Christoph and Martin Lange. They wanted to share their love for a cuisine they call Modern European, a fusion of French and Nordic cuisine, sprinkled with German notes. The kitchen is at the middle of the restaurant, so you can see the chefs preparing the dishes. Don’t miss the creation of angel hair caramel! 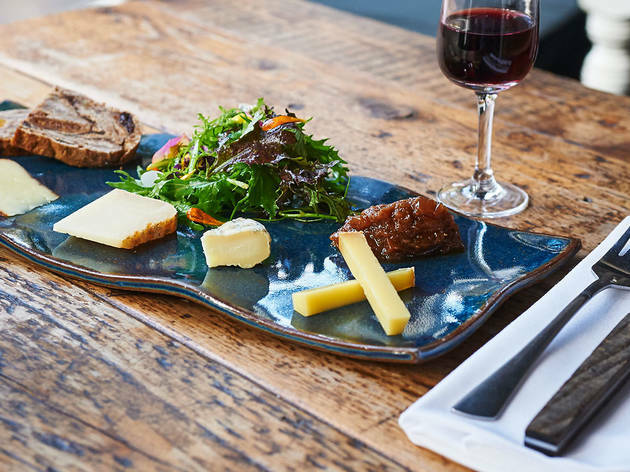 A nice selection of cheeses, a well-stocked wine list and crispy breads served on each table… the French influence is palpable. 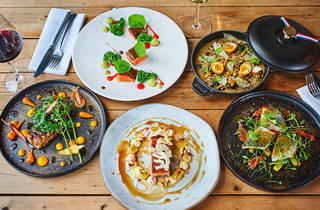 The menu, with its five main dishes, is simple, a sign that everything is fresh and cooked on site. Even if the service is pleasant, the products qualitative and the menu creative, you will not get out of this place completely broke. You can spend a good night for about £30. With very few seats, the place is intimate; so do not hesitate to book. Came here for a birthday dinner on the set menu and was not disappointed. In fact, my expectations were surpassed. Salut! 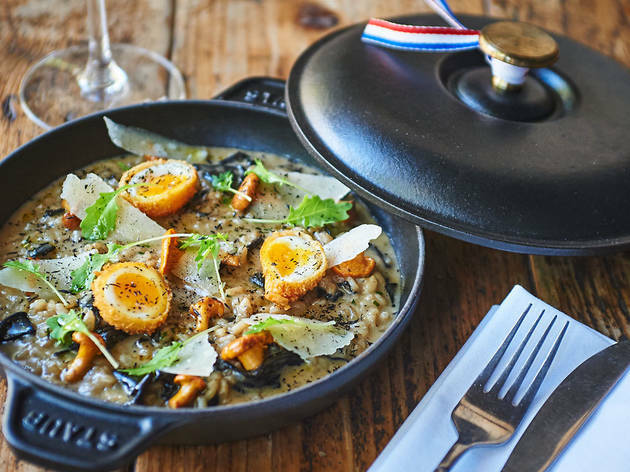 offers for me some of the most well cooked French style food, with modern twists that both work and enhance the taste of the produce on the plate. A starter of pheasant roulade was lovely though not mind blowing, but the main of venison was simply incredible. One of my favourite dishes of 2016 and was just mouthful after mouthful of food heaven. A dessert of chestnut cheesecake was great but again nothing spectacular. If it sounds like I'm not keen on the starter and dessert, this is only because by comparison, the main dish was seriously just that good. By any other standards I'd have at restaurants, the starters/desserts were great. My only critique is that perhap yes, the portion sizes were not huge. I was most definitely full however, but as the dishes lack traditional amounts of carbs, I was feeling peckish a few hours later. Definitely a venue worth considering for a special meal! I went yesterday night for a birthday meal for myself and my boyfriend and 3 friends. Firstly, I had been emailing them a few times with changing numbers, they were prompt in their response and very friendly. The restaurant is only small, but it adds to the ambience. We had a table right by the chefs, which was nice to watch them prepare all the different meals. Myself and 1 of my friends had a halibut dish with a mushroom sauce which was amazing! My boyfriend had the deer which he raved about! We shared 2 of the deserts, a pumpkin cheesecake like item and some chocolate spheres. Both were lovely, more so was the pumpkin which I wouldn't usually pick. 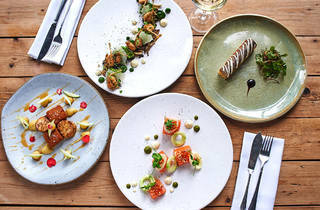 Some of the comments below complain about the portion sizes, but the food is very rich, with amazing produce and it means you have room for a starter, main and desert? right!? It was the right size for me. I'd also like to add that the wine was lovely and the waiter bought us over some free glasses of wine (which was a new wine they were looking to put on the menu, it had 2 cats in astronaut suits, and it was a favourite). I will be eating there again! And I hope others do too! Fantastic restaurant! From the moment we walked in we felt incredibly welcome. The service was very good and the staff was attentive and happily clarified all our questions about the menu. 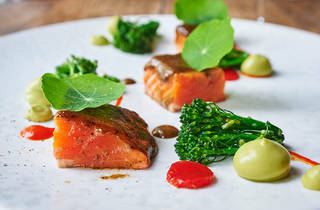 The food was made with fresh and good quality ingredients and was beautifully presented. All dishes were delicious and the dinner was one of the best I have had in years. I highly recommend having a meal at Salut! This restaurant has such a nice atmosphere. With its open kitchen, wooden tables and Scandi-style furniture it feels very cool and cosy at the same time. The food is fantastic, not overly original but the preparation is exceptional and the dishes are full of flavour. Definitely try the King Crab starter, which is absolutely delightful. In terms of mains, the sirloin steak and the hake are to be recommended. Prices are extremely reasonable, which only makes the experience better in my opinion. Oh and do have a look at the dessert menu! Even though I am not a dessert person at all, the poached pear with white chocolate mousse and fresh berries was totally worth the extra calories! 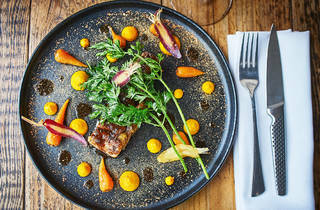 An exceptional restaurant - great spot by Time Out. The crab and pork were both dishes of the very highest order. I've since told so many of my friends about this place that we're booked in for a few weeks' time. Thanks for the great feed! Interesting, stripped back, very east end hipster. I enjoyed the theme as I walked in. I could see the kitchen and chefs preparing the food and there were less than 30 covers. My kind of place, a place dedicated to the food, not spending too much thought on unnecessary frills. The waitress was immediately attentive and happy. A good start. 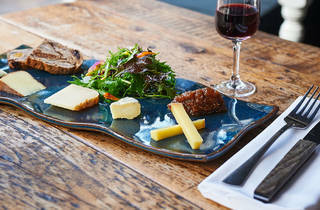 The Food:The menu is simple, a handful of each course. A lack of description creates some mystery added by the unknown ingredients on the menu, overall intriguing. Overall we are not huge eaters and noticed that mains portion sizes looked large so we opted for some starters to share before our main courses. The Starters:We ordered a crab salad, a raw salmon and wood pigeon. The crab salad was the best of the three, overall a great dish which I'd order again. The other two were bland, misguided and really gave me no inspiration. Unfortunately at this point we noticed that the beautiful decoration that was provided along with the dish was consistent in each. By this i mean they used the same two sauces one each of the starters. To me it would be rare that the same combination of two sauces would work with raw salmon, wood pigeon and crab. Sadly, I was correct and it showed that the food presentation was thought about before flavour combinations. Nothing on each plate was terrible but at nearly £10 a starter I like to feel like I am paying for something clever or interesting, I wasn't. The Mains:We ordered a vegetarian dish, two venison dishes, a lamb chop and a hake. Most of which were fine, again nothing interesting or inspiring. Nothing to talk about, nothing to evoke any emotion other than disappointment. I don't want to dwell too much on the mains because it was so underwhelming. The meats were cooked perfectly (Unlike described in the fabricated story above) and so were the accompaniments but nothing was flavoured sensationally.Maybe I am particular but if someone were to charge me £21.50 for a main I would expect more than just a well cooked piece of meat? Now sadly we have to move onto the more distressing part of the meal (yes, I know..). My venison was completely inedible! Sometimes mistakes happen, I am not one to forgo that. So I politely told my waiter that the meat was inedible. I tried my sisters and it was much better, however, sometimes when a main isn't served properly you lose your appetite. I am sure others can relate. Anyway, at this point my waiter offers me another portion at which I decline because the moment has passed and I know that by the time my food will arrive everyone would have finished. He pushes and pushes and promises that he'll get another out to me "in 2 minutes" at which point I accept. He did the right thing, he was forceful but in the right way he knew thats what he needed to do to save this meal! Sadly, the dish arrived 15 minutes later, after which everyone had finished. I politely ate my meal quickly (it was significantly better the second time) but couldn't enjoy as the rest of my family had already put their cutlery down. We ordered some desserts because they looked great. They tasted great, the poached pear was wonderfully light with fresh summer fruits, cream and crumb. Whats not to like! Overall, the place deserves 1 star. It very much over promises and under delivers. There are some positive, like the dessert and the lovely bottle of South African White but sadly its price points opens it up to scrutiny in which it cannot handle. The service was very hit and miss, the waitress was great, the manager was terrible. The icing on the cake has to be the childish manner in which he handled himself below. 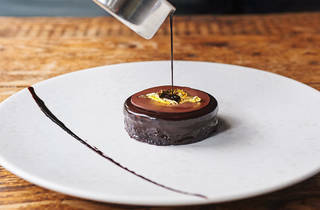 Recommendation: At £50 per person, I can think of many restaurants that are a stones throw away where you will be better treated and given some very well considered and interesting food! Happy Eating. What a shame. 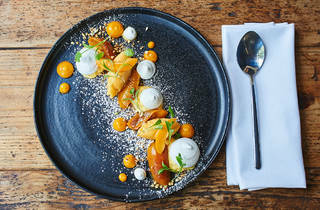 The food lacks flavours and imagination ( yes, the pictures look great but that's about it). Sauces served with the starters are the same sauces served with the mains. The atmosphere in the restaurant is off putting ( the place is so small but not cosy; the kitchen being a part of the restaurant didn't play its charm). The service is '' friendly cold'' if that makes sense but not attentive. i question if all the great reviews were written by their friends as i am having a difficult time to understand how a real foodie could appreciate the lack of flavours! I felt so cheated that we had to pay quite a bit of money for the food we didn't enjoy. Disaster. Will never be back. Shocking to see timeout highly recommends this place. Great food.. Salmon is a must try..
Amazing food and a superb atmosphere!!!! Highly recommend their Salmon dish (pict 5) - Awesome! Simply superb ! A festival for your taste buds equivalent to the delight to be had from Michelin star restaurants, but at a more reasonable price. The lamb was devine, perfectly cooked to our liking and together with the mushrooms, the spinach and the sauces made a perfect symphony. But that is not all. The chef and staff did everything they could to serve us quickly, as we were late and had a movie to catch. A wonderful experience all in all. May they thrive and proposer ! So rare to find a really good restaurant in London that serve both nutritious and gourmet food. 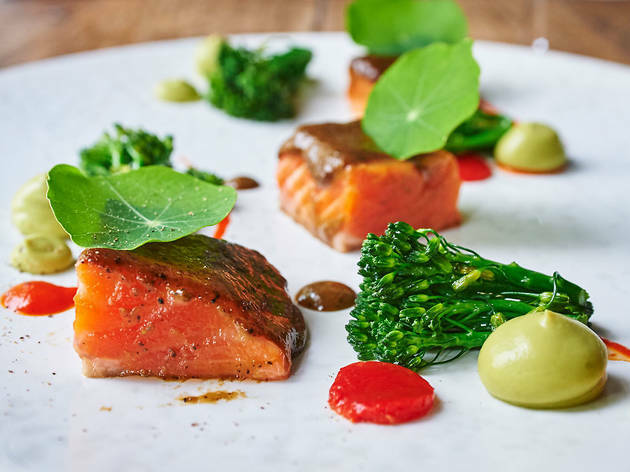 I have visited the restaurant a few times with friends and family now and can only say it's attention to detail, atmosphere, friendly service and of course fantastic dishes are just incredible! 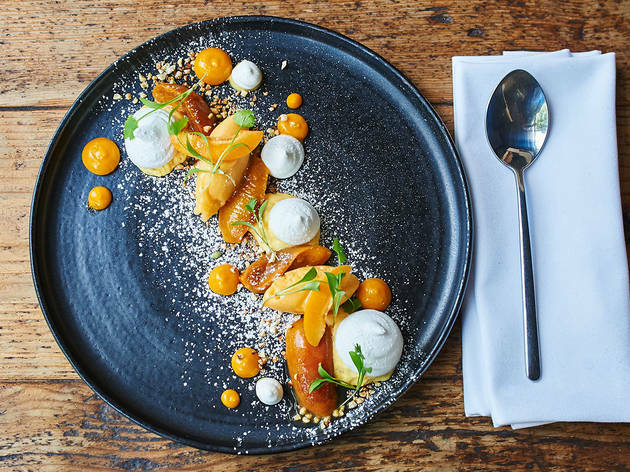 The dishes are beautifully presented, probably complex, yet presenting familiar and often pleasantly unexpected combinations of flavours. I love the steak tartare and the house red which are normally my choice to start the meal. I would definitely recommend if you're looking for something a bit more special and intimate (away from busy Angel, but still on the main road) or a short walk from Dalston. I have also been there at lunchtime and enjoyed the tranquil atmosphere with a great cup of coffee!